The pipelines exporting tar sands out of Alberta are almost full, according to new analysis by Oil Change International. 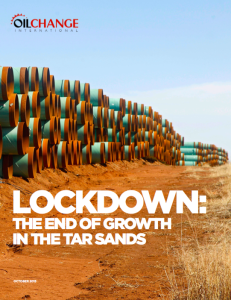 Without major expansion-driving pipelines such as Energy East, Kinder Morgan or Keystone XL, there will be no room for further growth in tar sands extraction and tens of billions of metric tonnes of carbon will be kept in the ground. This would be a significant step towards a safer climate. All proposed new pipeline routes out of Alberta are facing legal challenges, opposition by local authorities and regulators, and broad-based public opposition. All of the major projects have been significantly delayed with some cancellations seemingly imminent. No pipeline has been built since 2010, despite active industry efforts. Download the executive summary here in English and here in French. I admire and appreciate your excellent efforts in addressing the horrors of allowing any growth of the tar sands. However in the masthead you talk about “fossil fuels”. As an engineer, and one appointed to the WV Public Energy Authority by then Governor Manchin, I have been a voice for accelerating the transition from coal to renewable energy technologies in a State whose economic existence is dependent on severance taxes. Do you have any similar reports on the worst of all fossil fuels, coal. I need all the ammunition I can get! Thank you and I look forward to your good thoughts. P.S. I’m a native of Ontario. Exciting news, keep us posted on future actions. Thank you. Thanks for your comment! We have done a fair amount looking at how public subsidies and various multilateral development banks support coal development globally (a recent report here: http://priceofoil.org/2015/06/02/rug-governments-international-institutions-hiding-billions-support-coal-industry/), and we have another coal financing report that will be released in the coming weeks. We do not have any analysis quite like the Lockdown report for coal, but one of our partners on this paper, the Institute for Energy Economics and Financial Analysis, does dig into more of these details. They are at ieefa.org. As a member of the Council of Canadians and also of the groups against Enbridge’s 40-year-old Line 9 pipeline through southern Ontario and Quebec, I was astonished and alarmed to read in the business section of the Globe & Mail, Friday Dec. 4th, P.8, a small paragraph stating that the (dirty bitumen) oil product has resumed its flow, (in the reverse direction for which it was intended), without any warning to residents along its route. Until now, it was still supposedly awaiting further environmental and engineering safety quality checks, mandated by a commission beyond the original politcally controlled NEB. This needs to be investigated and exposed pronto!